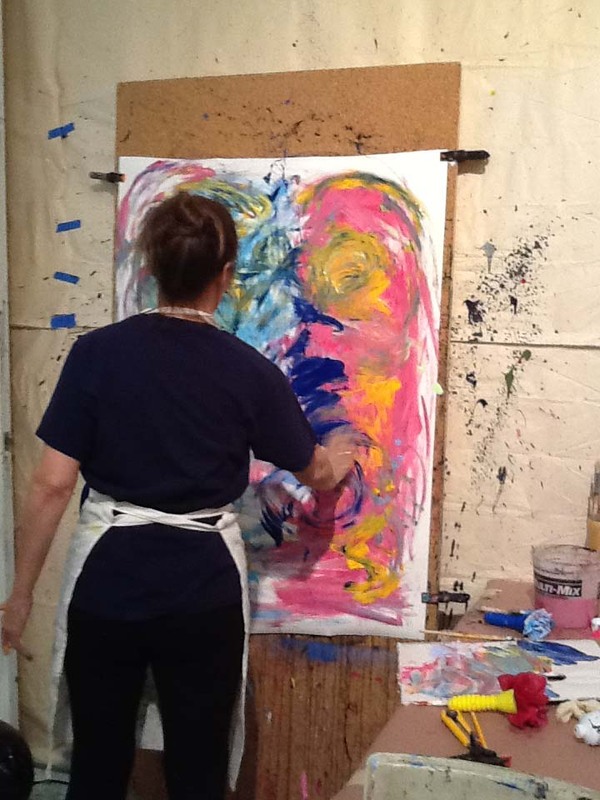 My experience with “gestural art workshop” keeps moving in All directions. Colors articulate the depth of a magical dream, of a passionate poem, of an ever evolving love affair with life. Thanks Claudia for this sacred space of play. 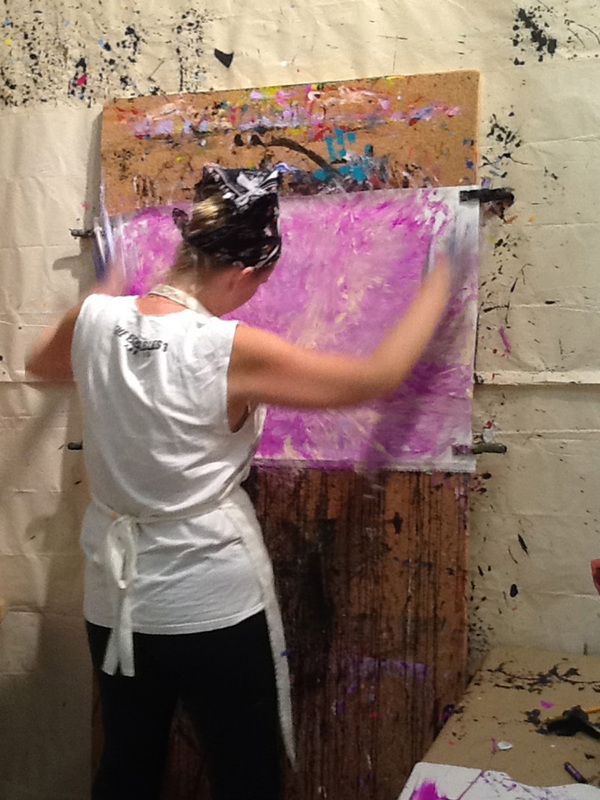 I had a blast in Claudia’s workshop — a color blast! I’m not a painter, but I had so much fun and painted such beautiful paintings. I also had an amazing check-in with my inner child, who had so much to express! 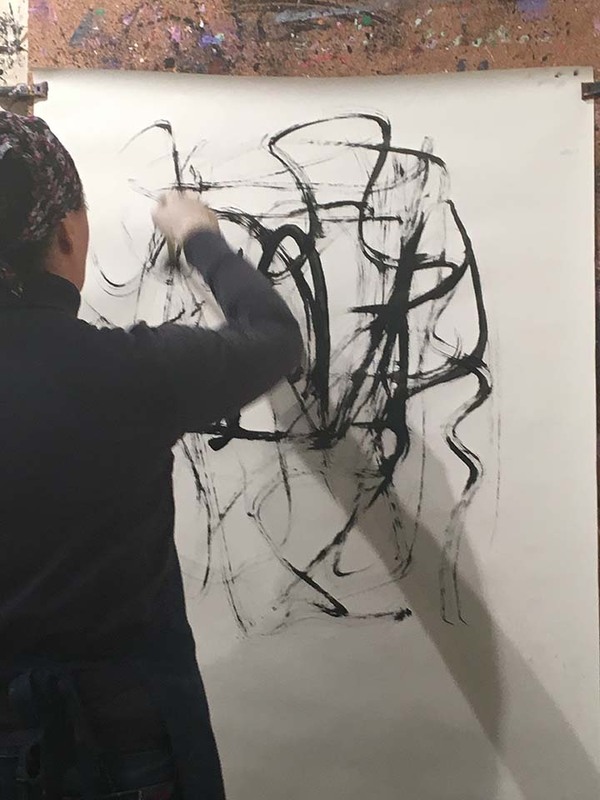 Think of free form writing only it’s painting with your hands or sponges or brushes — but with your eyes closed. Yet unlike free form writing, you will want to keep these paintings and show them off with pride. It’s an amazing, deep, fun workshop. Try it! La oportunidad de tener un espacio para expresarte artísticamente fue increíble. La forma en la que Claudia dio guía al trabajo, sin juicio y sin presión logro que me sintiera libre y abierta para expresar y luego interpretar. Recomiendo este taller mucho tanto a adultos como a niños. Es interesante y divertido! 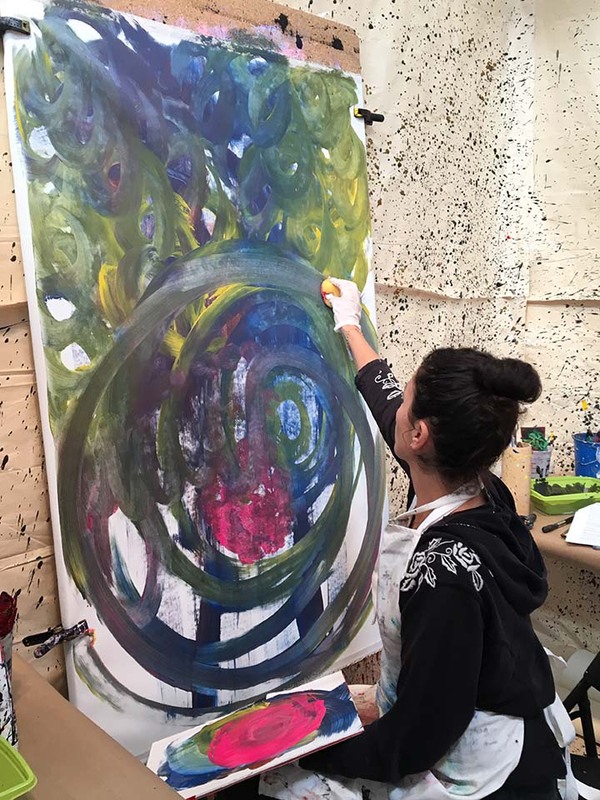 ” The opportunity to have an space to express artistically was incredible. The way Claudia guided the work, without judgement or pressure allowed me to feel free and open to express and then interpret. 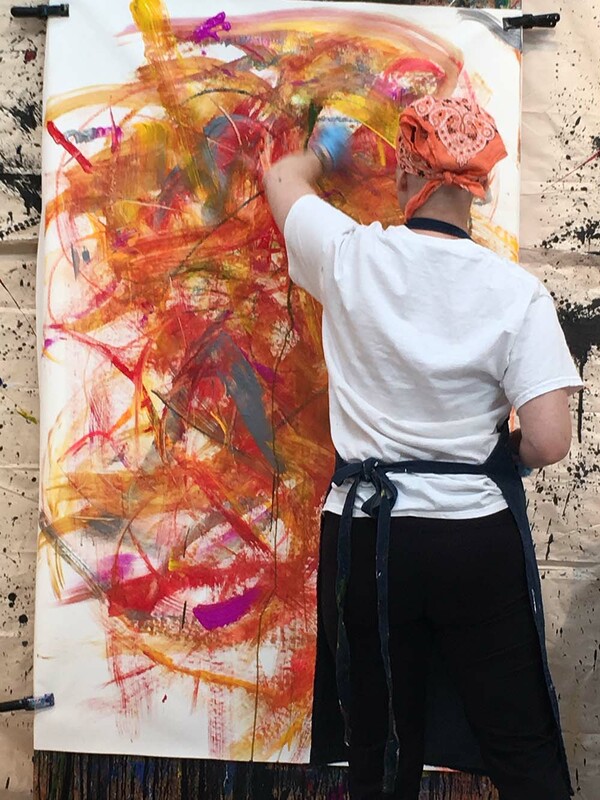 I have participated in two Gestural Art workshops and I will do it for sure many more times. It is a completely different experience!!! I did not need to be an artist or to have any previous experience, everything flowed once I started painting. I felt that I relieved all my inner emotions and at the same time explored my unconscious self. 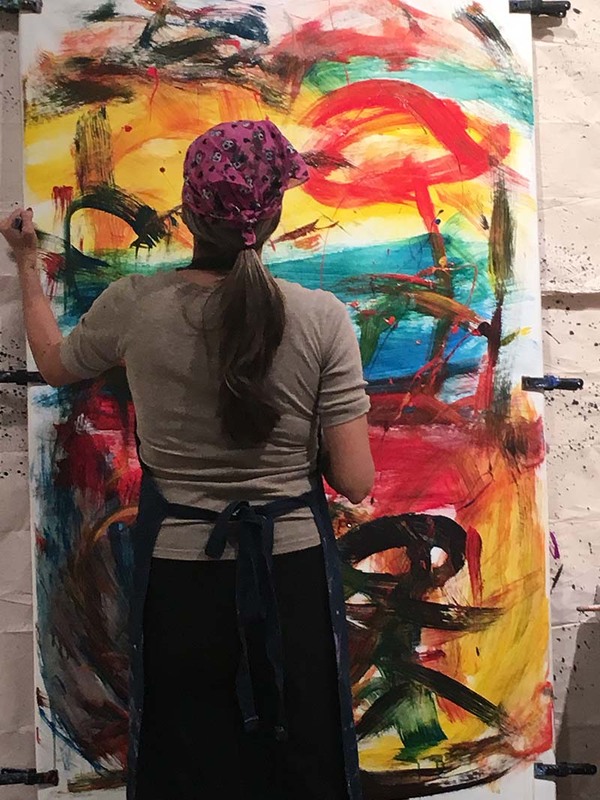 After the initial meditation and during the whole session I felt connected with God and with my spiritual being and I was able to discover my creative side and express my self inside out. Black and white or a mix of colors create unique pieces of art that come from deep inside, I can tell I painted guided by my soul!!! Thank you Claudia for such an amazing and unforgettable experience!!! What an amazing workshop, and I highly recommend it to anyone. Like many of us, I did painted through high school and early college years, but eventually stopped doing for all the usual reasons – time, family, work, etc. 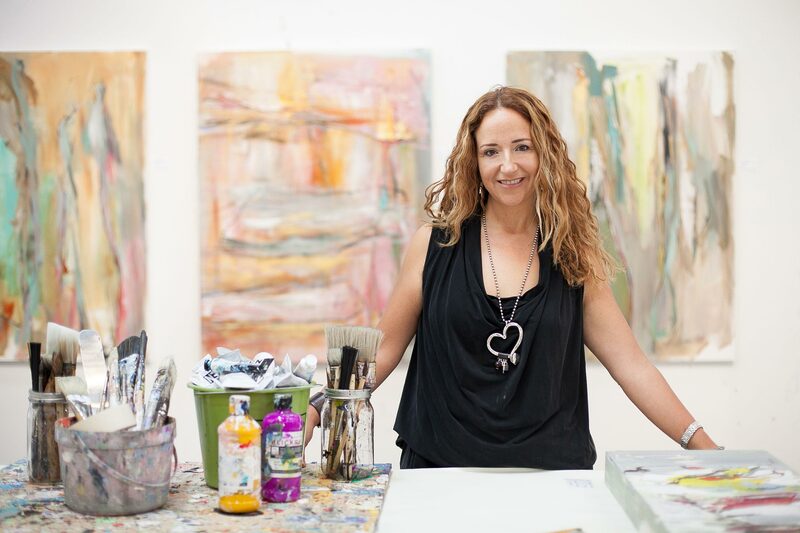 I was nervous going back into the studio – it had been so long. Would the paints and brushes still remember me as a friend? While I fumbled to get oriented, Claudia was kind and encouraging. She reminded me that artistic expression is completely natural for us all [cave paintings and symbols may have been around before speech] and helped me to relax with gestures and stretches. I got the sense that the process was perhaps more important than the product, and we even worked with closed eyes! I felt relaxed and inspired the whole time, a combination that is rare to find. Because the design of the workshops is so flexible, you can come once or as many times – there is no commitment, only expression. I went alone, but have heard of couples going together, and mothers and daughters. Next time I’d like to bring a friend so we could have the experience together. I strongly encourage these events, as one might recommend a massage or a trip to the spa. We have a necessary need to express ourselves, and through this workshop I found that I can let go and relax, be free, and also energized. My experience at the workshop was amazing. Claudia guides us in a way that we can really connect with our inner self. I found out few things about my self that were repeatedly showing in my drawings. The final painting was just full expression. So emotional and powerful. When I finished, I felt I had discovered something that was coming to the surface in a very natural way. There were no expectation and no painting techniques or anything like that, it is much deeper than that. Just letting your self go and flow. I loved it.